An example of the decisions tab, from the point of view of Venice at 1444. Decisions are a set of choices a nation can make if certain conditions are met. Each decision has consequences, which can be both positive and negative. A nation never has to take a decision; it is always at the player's discretion whether to accept a decision or not. Some decisions are nation specific, some are religion specific and some are more generic. 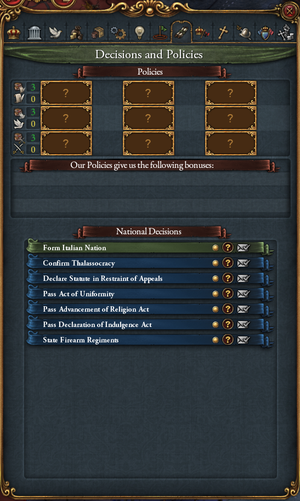 The option to make a decision appears in the alerts zone of the main screen and when clicked opens up the decisions interface. Some decisions have negative effects too and if they are judged to be too damaging a decision can be ignored by deselecting the circle to the left of the question mark in the interface. This page was last edited on 4 July 2018, at 22:11.